Halloween 2016 is done and our family costumes were a hit. They weren’t nearly as time intensive as the Lego costumes, but more work than our pirate family or Incredibles costumes. 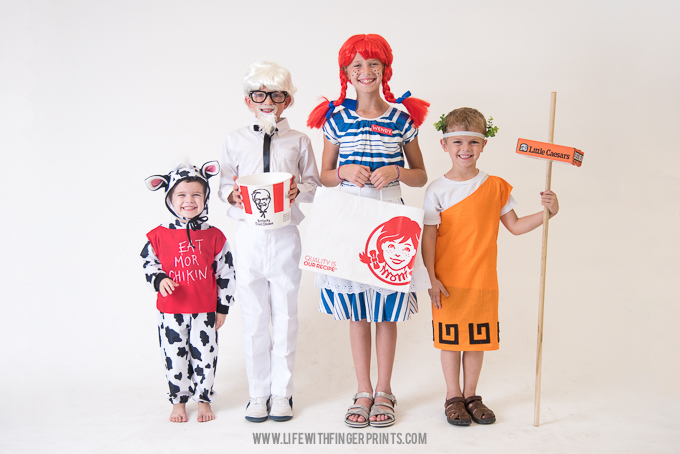 This year’s family costumes we were fast food mascots. Everyone got to choose who they wanted to be and when all was said and done, I ended up with the leftover – the clown that no one else wanted to be! 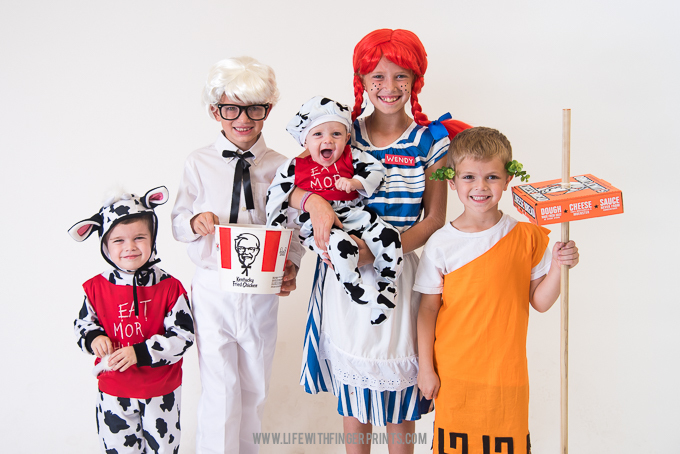 We had Jack-in-the-Box, Ronald Mcdonald, Wendy, Colonel Sanders, Caeser and the Chick-fil-A cows. The most time consuming part was driving around to the six restaurants and requesting their boxes/buckets/bags. 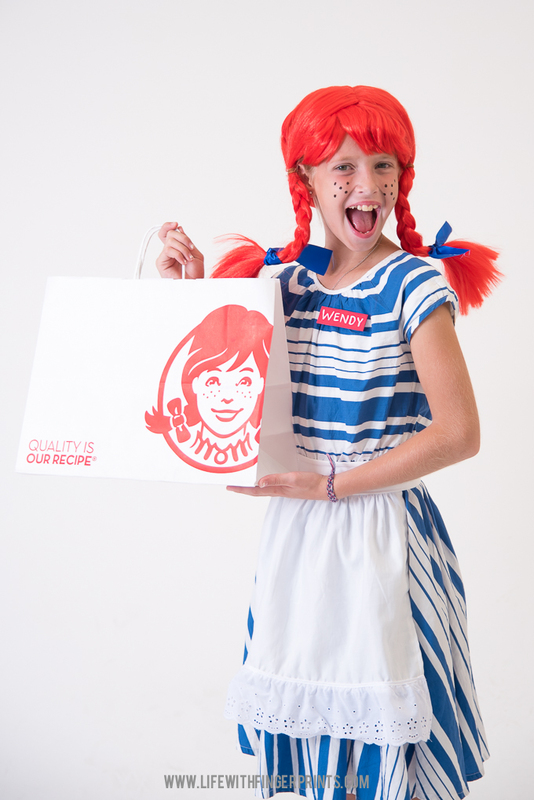 Hallie already had a blue and white stripe dress, so we made a white apron, a nametag and purchased a red wig and added blue ribbon. Hunter already had a white shirt and we purchased white pants for his upcoming baptism. 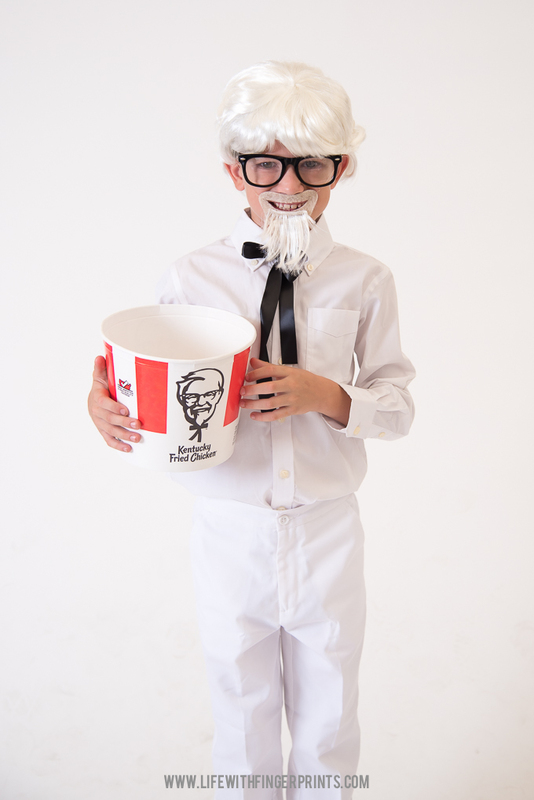 We purchased a white wig/beard. The beard that came with the wig ended up not working out so well, so I cut some felt and attached some hair from the beard. I tied jewelry elastic to it so he could wear it. The glasses were purchased online. 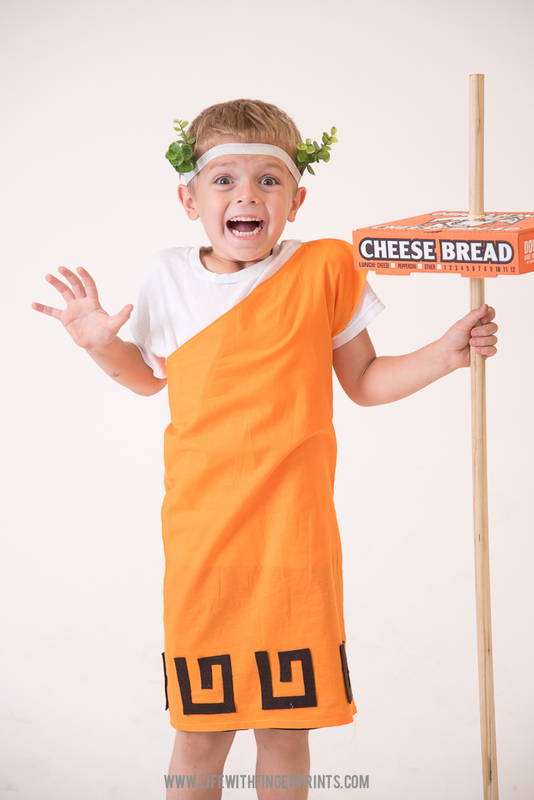 It’s hard to find a kids Caesar costume. I made his orange toga and hot glued felt to the bottom. We cut up some greenery and attached it to his head using a headband and poked some holes in a pizza box and stuck it on a stick. 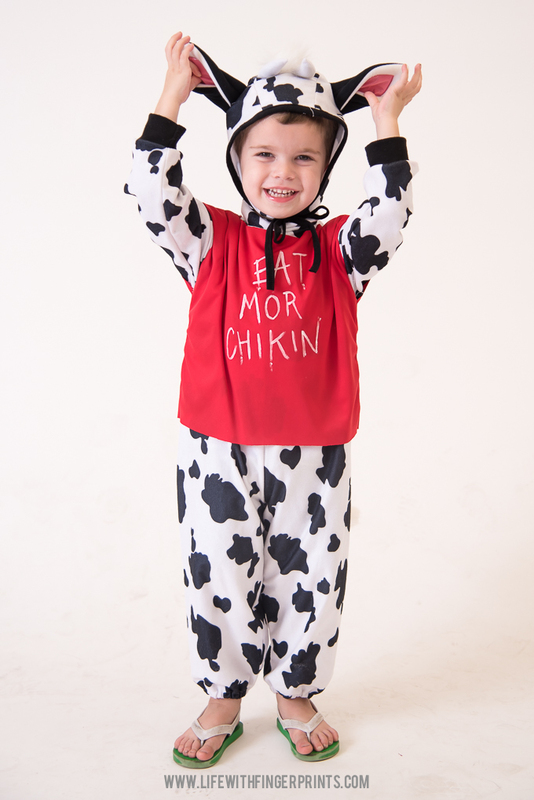 Cow costumes were more difficult to find than I anticipated. I assumed I could borrow from someone. When that didn’t pan out, I turned to the stores and then online. Everything I saw was overpriced and fancy. I just needed a cow jumpsuit and found a cheap one on Ebay. I made a red shirt (because it was just as difficult to find a red shirt as it was to find a cow costume) and painted the words. Briggs was the matching cow and I found a onesie/pants set online that worked perfectly. Steve was able to use a suit he already owns and the head…well making the head requires a post all on its own but I’m pretty excited to have that thing in our Halloween arsenal! 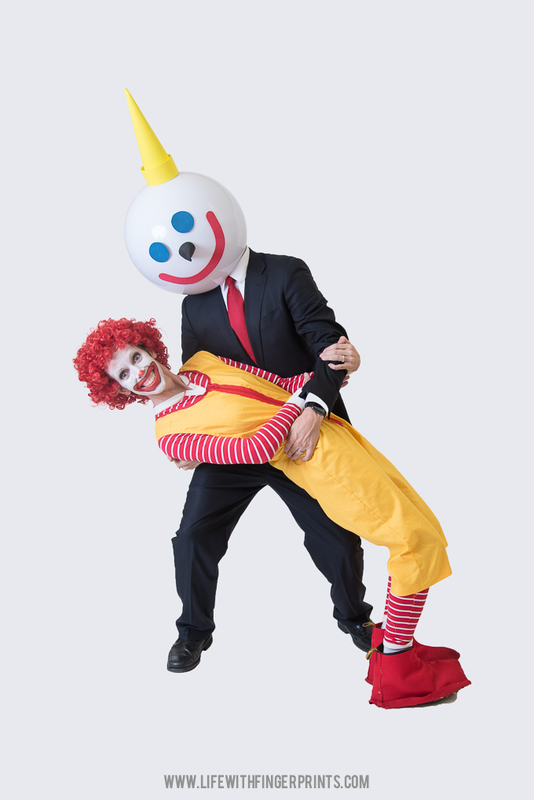 In case you ever have a desire to dress up as a clown…don’t. Your kids will be scared of you and face makeup is never a good idea. 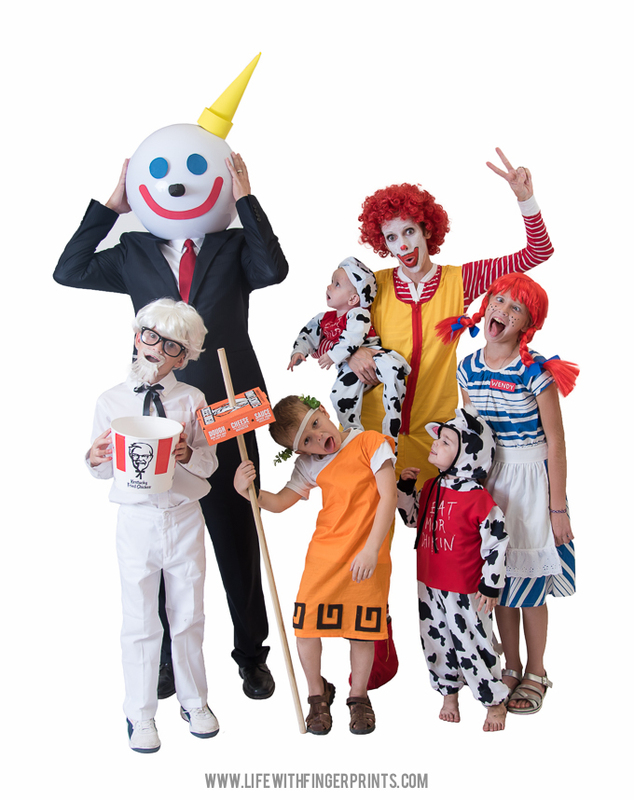 But how can you have a family of fast food mascots and not have Ronald? Oddly enough I had the red/white stripe onesie. It was shipped here accidentally two years ago in someone else’s name and they never came to pick up the package. I threw it in the closet thinking Hallie would enjoy it one day. It came in handy this year. I made the yellow jumpsuit because let’s be real…they are not in style and even searching online I came up short. The red wig was purchased online and I was told more than once permed short hair should never be in my future! Is there any question that we’re a crazy bunch? 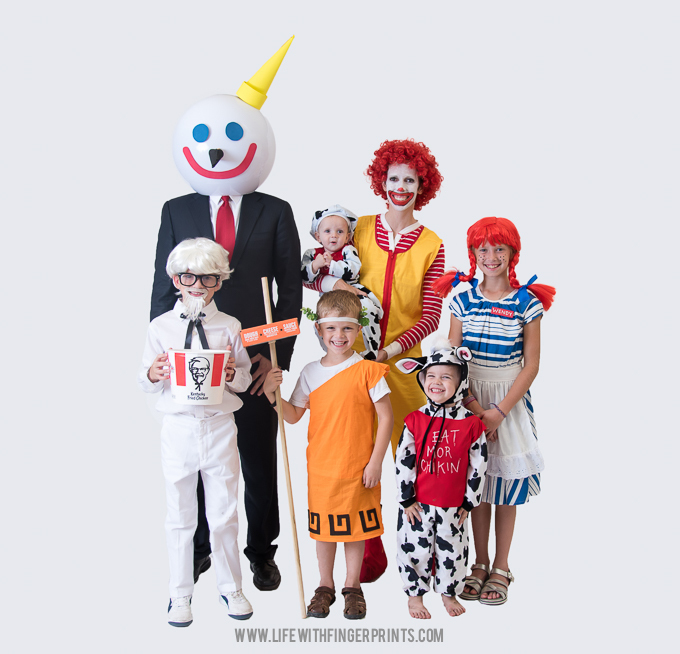 Nope – and we’re just crazy enough to go out in public dressed up as fast food mascots. Wow, you all look great! And what a creative idea! Just wow!!! You must be the most creative person I know. Knocked it out of the park Kara! Love it.